Cicale, for an authentic Mediterranean dining experience located in a renovated finca in the Northern San Lorenzo hills - it is run with love and passion by Michela Primavera from Rome and Paolo from Bologna. Their Italian background and love for fashion and food explains the passion which goes into every dish they serve. The pasta is home made, the vegetables homegrown, the wood-fire oven gives a succulent smoky taste to the Parmegiania and Oven dishes, and their creamy coffee ice with baileys served in a cocktail glass is divine. 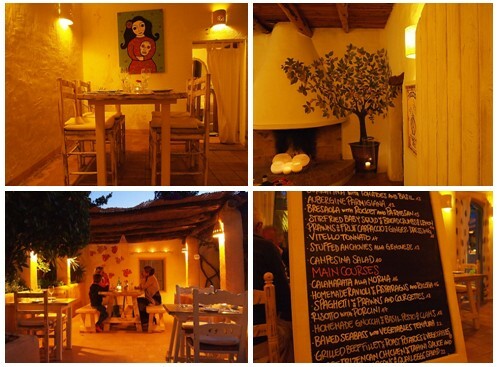 Dine outdoors under the San Lorenzo stars or choose one of the cosy rooms inside the finca. The couple restored the finca beautifully, added a kitchen, redesigned the roof and Michela decorated the interior and garden dining area with wonderful night lanterns, flowing white curtains, touches of blue, local art and a fashion boutique to enjoy in the summer months.